Çatalhöyük (ʧɑtɑl højyk also Çatal Höyük and Çatal Hüyük, or any of the above without diacritics) was a very large Neolithic and Chalcolithic settlement in southern Anatolia, a province in central Turkey, dating from around 7500 B.C.E. for the lowest layers. The word çatal is Turkish for "fork," while höyük means "mound," thus the name means roughly "forked mound." It is perhaps the largest and most sophisticated Neolithic site yet uncovered, and is considered a major turning point in the development of civilization from nomadic life toward permanent communities which eventually developed farming. The settlement also contains among the finest examples of Neolithic art and religious symbolism. Çatalhöyük is located in Turkey's Konya province. Çatalhöyük is located overlooking wheat fields in the Konya Plain, southeast of the present-day city of Konya, Turkey, approximately 140 km (87 mi) from the twin-coned volcano of Hasan Dağ. The eastern settlement forms a mound which would have risen about 20 meters (65 ft) above the plain at the time of the latest Neolithic occupation. There is also a smaller settlement mound to the west and a Byzantine settlement a few hundred meters to the east. The prehistoric mound settlements were abandoned before the Bronze Age. A channel of the Çarsamba river once flowed between the two mounds, and the settlement was built on alluvial clay which may have been favorable for early agriculture. First discovered in 1958, the Çatalhöyük site was brought to worldwide attention by British archaeologist James Mellaart's excavations between 1961 and 1965, which revealed this section of Anatolia as a center of advanced culture in the Neolithic period. The site rapidly drew international attention due to the large size and dense occupation of the settlement, as well as the spectacular wall paintings and other art that was uncovered inside the houses. Mellaart was banned from Turkey for involvement in the Dorak affair in which he published drawings of supposedly important Bronze Age artifacts that later went missing (Pearson and Connor, 1968). The site lay idle until September 12, 1993, when investigations began under the leadership of British archaeologist Ian Hodder from the University of Cambridge. These investigations are among the most ambitious excavation projects currently in progress according to British archaeologist Colin Renfrew. In addition to extensive use of archaeological science, psychologists' and artists' interpretations of the symbolism of the wall paintings have also been employed. The complex settlement was described by Mellaart as the earliest city in the world. However, it is more properly described as a large village rather than a true town, city, or civilization. The community seems to have consisted entirely of domestic housing with open areas for dumping rubbish. Each house usually contained three rooms. There are no obvious public buildings or signs of division of labor, although some dwellings are larger than the rest and bear more elaborate wall paintings. The purpose of larger structures remains a subject of scholarly debate. On-site restoration of a model of a typical neolithic house interior at Çatal Hüyük. The population of the eastern mound has been estimated at up to 10,000 people, but population totals likely varied over the community’s history. An average population of 5,000 to 8,000 is a reasonable estimate. The houses of Çatalhöyük, which are clustered in a honeycomb-like maze, were so tightly packed together that there were few or no streets. Access to interior spaces was across roofs—which were made of wood and reeds plastered with mud. Most were accessed by holes in the ceiling, which were reached by interior and exterior ladders. Thus, their rooftops were their streets. The ceiling openings also served as the only source of ventilation, letting in fresh air and allowing smoke from open hearths and ovens to escape. Houses had plaster interiors characterized by squared off timber ladders or steep stairs, usually placed on the south wall of the room, as were cooking hearths and ovens. Each main room served as an area for cooking and daily activities. Raised platforms built along the walls of main rooms were used for sitting, working, and sleeping. These platforms, and all interior walls, were carefully plastered to a smooth finish. Additional rooms were used as storage. All rooms were kept scrupulously clean. Archaeologists identified very little trash or rubbish within the buildings, but found that trash heaps outside the ruins contain sewage and food waste as well as significant amounts of wood ash. In good weather, many daily activities may also have taken place on the rooftops, which conceivably formed an open air plaza. In later periods, large communal ovens appear to have been built on these rooftops. Over time, houses were renewed by partial demolition and rebuilding on a foundation of rubble—which was how the mound became built up. Up to eighteen levels of settlement have been uncovered. The people of Çatalhöyük buried their dead within the village. Human remains have been found in pits beneath the floors, and especially beneath hearths, the platforms within the main rooms, and under the beds. The bodies were tightly bent before burial, and were often placed in baskets or wrapped in reed mats. Disjointed bones in some graves suggest that bodies may have been exposed in the open air for a time before the bones were gathered and buried. In some cases, graves were disturbed and the individual’s head removed from the skeleton. These heads may have been used in ritual, as some were found in other areas of the community. Some skulls were plastered and painted with ocher to recreate human-like faces, a custom more characteristic of Neolithic sites in Syria and at Jericho than at closer sites. The surfaces of many houses throughout the settlement are covered on interior and exterior walls with vivid murals and figurines. A wall map of the village is currently recognized as the world's oldest map. Predominant images include groups of men in hunting scenes, and red images of the now extinct aurochs and stags, and vultures swooping down on headless people. Heads of bulls and other animals were often mounted on walls. In addition, distinctive clay figurines of women have been found in the upper levels of the site. Although no identifiable temples have been found, the graves, murals and figurines suggest that the people of Çatalhöyük had a religion that was rich in symbolism. Rooms with concentrations of these items may have been shrines or public meeting areas. The people of Çatalhöyük" appear to have lived relatively egalitarian lives with no apparent social classes, as no houses with distinctive features (belonging to kings or priests, for example) have been found so far. The most recent investigations also reveal little social distinction based on gender, with both men and women receiving equivalent nutrition and apparently having relatively equal social status. The residents cultivated wheat and barley, as well as lentils, peas, bitter vetch, and other legumes. They herded sheep and goats and evidence suggests the beginning of cattle domestication as well. However, hunting continued to be a major source of meat for the community. The making of pottery and the construction of obsidian tools were major industries. Obsidian tools were probably both used and traded for items such as Mediterranean sea shells and flint from Syria. 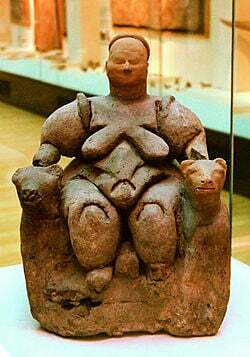 Enthroned goddess flanked by lions. “There are full breasts on which the hands rest, and the stomach is extended in the central part…. As one turns the figurine around one notices that the arms are very thin, and then on the back of the figurine one sees a depiction of either a skeleton or the bones of a very thin and depleted human. The ribs and vertebrae are clear, as are the scapulae and the main pelvic bones…." Hodder questions whether the figurines represent religious deities, but he says they are significant nonetheless. He believes that before humans could domesticate the wild plants and animals around them, they had to tame their own nature—-what he calls a psychological process—-which is expressed in their art. Hodder also believes that Catalhoyuk’s early settlers valued spirituality and artistic expression so highly that they located their village in the best place to pursue them (Balter, May 2005). Hodder, Ian. "Women and Men at Çatalhöyük," Scientific American Magazine, January 2004. Pearson, Kenneth and Patricia Connor. The Dorak Affair. New York: Atheneum, 1968. Çatalhöyük – Excavations of a Neolithic Anatolian Höyük. Official Çatalhöyük website. Balter, Michael. 1998. The First Cities: Why Settle Down? The Mystery of Communities. Science Magazine. This page was last modified on 17 January 2017, at 17:24.